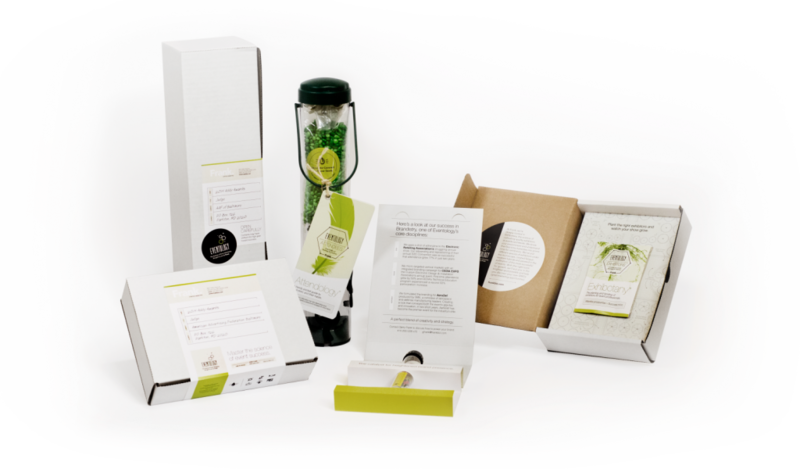 Every December, we send out a gift to thank our clients, stretch our creativity, and capture the zeitgeist. We often try to mix humor with pointed observations of the marketing and communications industry. This has included everything from a Binge TV Guide to a Vacation in a Bucket. This year was different. For over 20 years, Frank. Strategic Marketing has called Historic Ellicott City home. 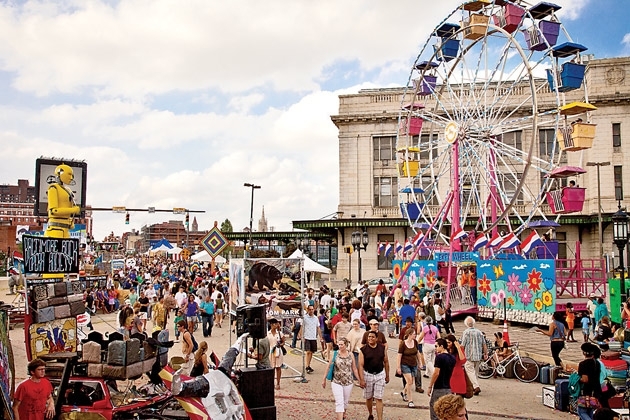 A quaint mill town founded in 1772 and home to the first train station in the country, the community is a mosaic of history, artistic expression, nature, and Americana. On the night of July 30, 2016, six inches of rain fell within two hours, causing a devastating flood that killed two people, gutted buildings, ripped away parts of Main Street, and swept cars into the Patapsco River. While our agency was spared, many of our friends and fellow businesses were not as fortunate. Even now, five months later, buildings along Main Street remain boarded up, storefronts closed, foot traffic sparse, and the town’s future uncertain. This holiday season, we’ve focused our creative energy on helping to rebuild Ellicott City one nail at a time. 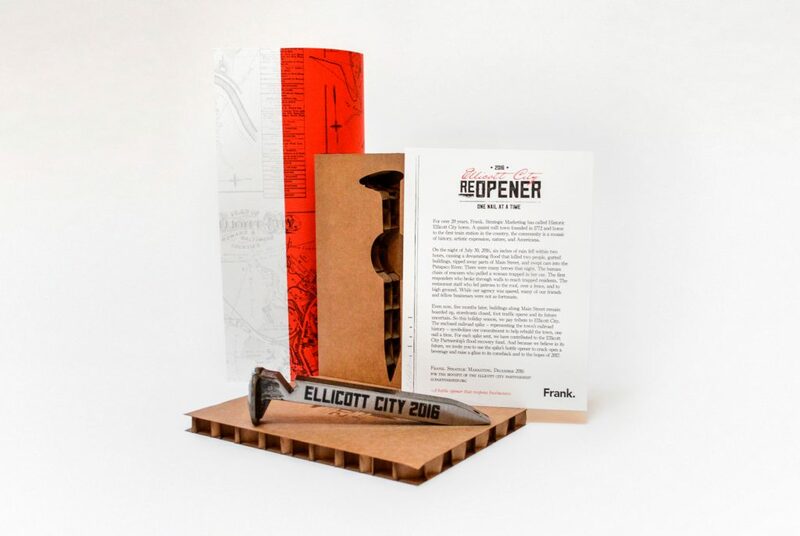 Engraved railroad spikes fashioned into bottle openers and housed in custom die cut, laser-etched honeycomb packaging, have been designed to commemorate the restoration efforts of 2016 that will continue well into the new year. For each spike sent, we have contributed to the Ellicott City Partnership’s flood recovery fund (ecpartnership.org). 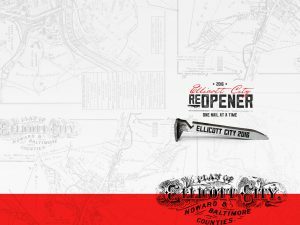 While the spike represents the town’s rich history, the bottle-opening feature represents the celebration of triumph over adversity. As 2016 draws to a close, we intend to crack open a beverage and raise a glass to the challenges of 2016 that have been met with determination and creativity. Cheers from everyone at Frank. As the weather heats up and the Dog Days of summer start barking, employees turn their attention to vacation and family. But for directors, managers, and team leaders the time between Memorial Day and Labor Day can be filled with anxiety. The tension only increases as they wonder how they will accomplish their yearly goals while short on staff. So how do you drive progress for the businesslike fall months if the summer months are about beaches and road trips? Every year that question drives managers crazy. But the answer may be right in front of you. Most managers may not realize it, but they have a personnel solution available to them that has already been vetted, chosen, and negotiated. This solution includes people who are expert in many crucial business and marketing functions, and expert in dealing with your organization’s own quirks and idiosyncrasies. Of course, we mean your marketing agency. When you think about it your agency can be the perfect resource for summertime supplemental personnel. They already have an in-house team that you can lean on when your employees take their well-deserved breaks. First, most marketing firms are filled with professionals from multiple disciplines. Typically they are rich in talent: Strategists, organizational experts, graphic designers, writers, public relations professionals and others can often be found under your partner-agency’s roof. The personnel at your agency aren’t merely experts in some professional skill they are also usually expert at understanding you. Because they are typically as entrenched in your business as your own people are, working shoulder to shoulder with your staff all year long. They understand the nuances of your design standards, nomenclature, approval process, and key players in a way that no ‘contract’ employee could. This specialized knowledge not only makes your agency personnel the highest quality resource you can turn to in the summer, but it also makes them a value choice. If you hire a contract employee you can spend all summer paying them just to get up to speed on the things your agency people already know by rote. For instance, a graphic designer hired through a temp or personnel firm or some other source, will have to spend expensive billable hours learning about you before they can productively do your work. They cannot create anything of value until they first understand your philosophies and key messages. To that point you should have a “Style Guide,” prepared by your agency. This important deliverable explains the finer points of your brand to any designer or writer who needs to work within its strictures. By pointing out details such as your typography choices and sizes, color palettes, acceptable photo and illustration options and much more, it will save a lot of time and ensure productive work. If you don’t already have a style guide, you should ask your marketing firm to develop one. A style guide will help any designer work more productively for you, but the graphic design specialists at your marketing agency are likely to be the same people who created your design standards to begin with. That’s what makes them such a seamless fit. When your agency artist sits down to do your summer work, there is little that they do not already know about how it should be done. They have an expert’s understanding of you and your organization so they are free to create and elevate your brand, not waste valuable time figuring out what might be minimally acceptable to you. The same is true of your agency writers. As the people who craft, shape and hone your messages all year, they have valuable institutional knowledge such as your industry, vocabulary, target market and context. Your marketing agency’s writers do not have to struggle to sound like you in ads, brochures or videos that are being created over the summer. They are your voice for all four seasons. When it comes to advancing your long-term marketing goals over the summer, familiar agency faces can be a real relief. Your agency strategists have usually shaped your goals all year long. At the very least, they have worked with you to meet the daily objectives in your master plan. Finally, utilizing agency personnel over the summer is about much more than the individuals you’ll utilize, no matter how talented they may be. It is about teamwork. Your agency professionals know each other and you and your people know them. They have methods of working seamlessly together with each other and with you that’s simply invaluable. So let your professionals go on the vacations they require and deserve. You don’t have to worry about their absences. Utilizing your agency resources well over the summer can ensure that your people recharge their batteries even while the machine of progress grinds on. 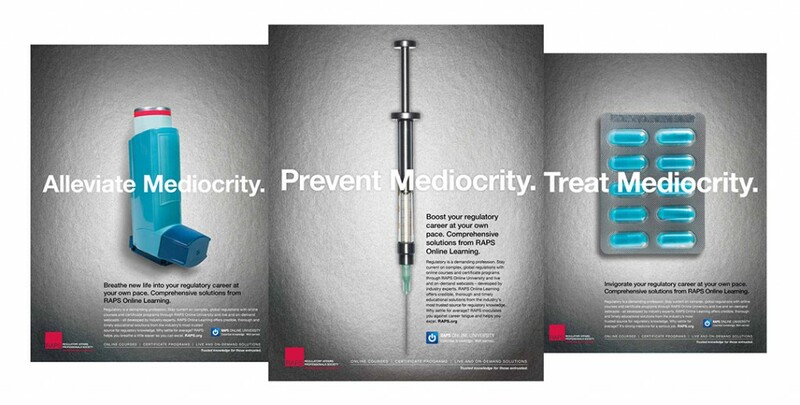 At the heart of Frank, we believe in strategically driven creative that powers campaigns. Informed messaging. Targeted audiences. Resonant takeaways. Trackable performance. 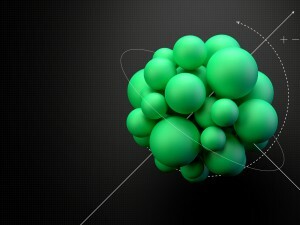 All paired with unexpected concepts, stunning visuals, and dynamic copy. And we apply this to our own projects as well – the Eventology Campaign is a prime example. 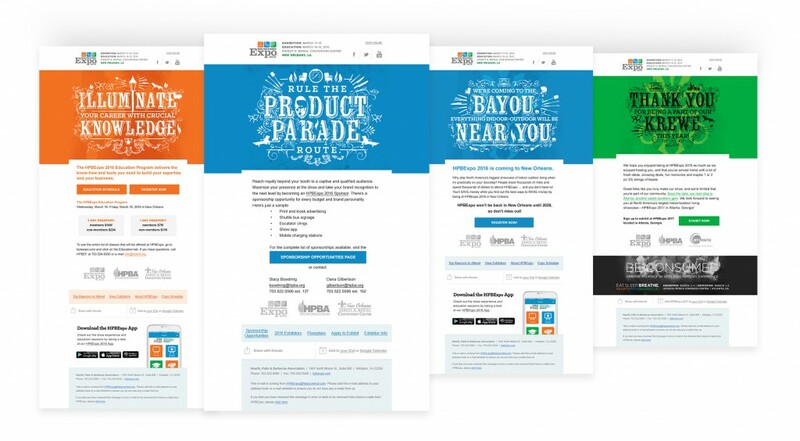 With 20 years of experience marketing for associations and their respective tradeshows, we developed Eventology – the science of event marketing – to showcase our approach in key marketing disciplines. 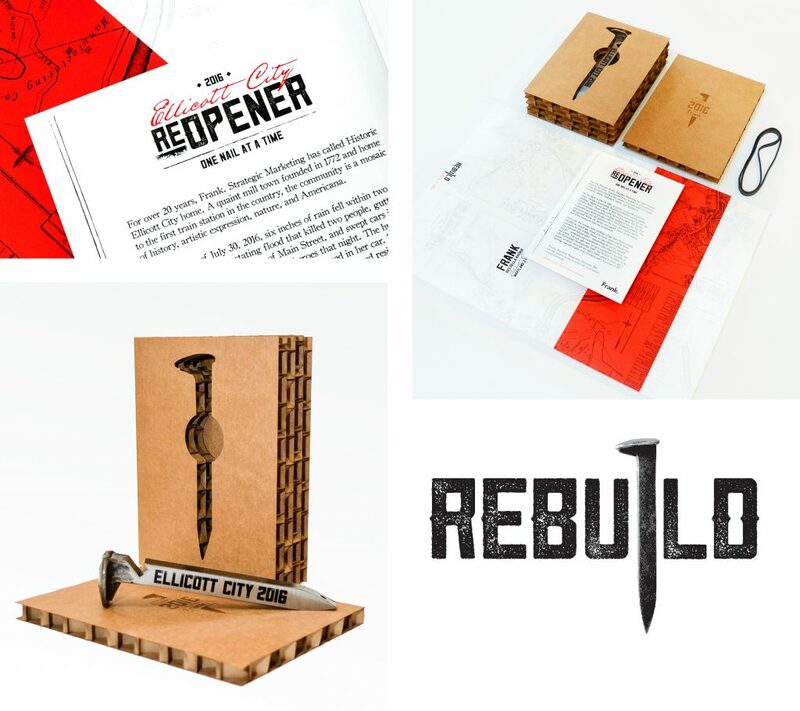 Through a series of direct mail packages, we explore scientific metaphors for enhancing event marketing. 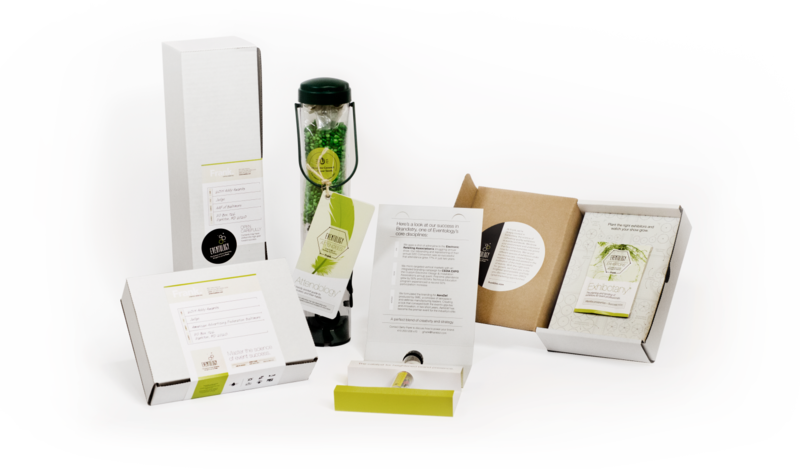 Eventology starts with Brandistry (the science of blending strategy and creative to generate an explosive reaction for your event’s brand). 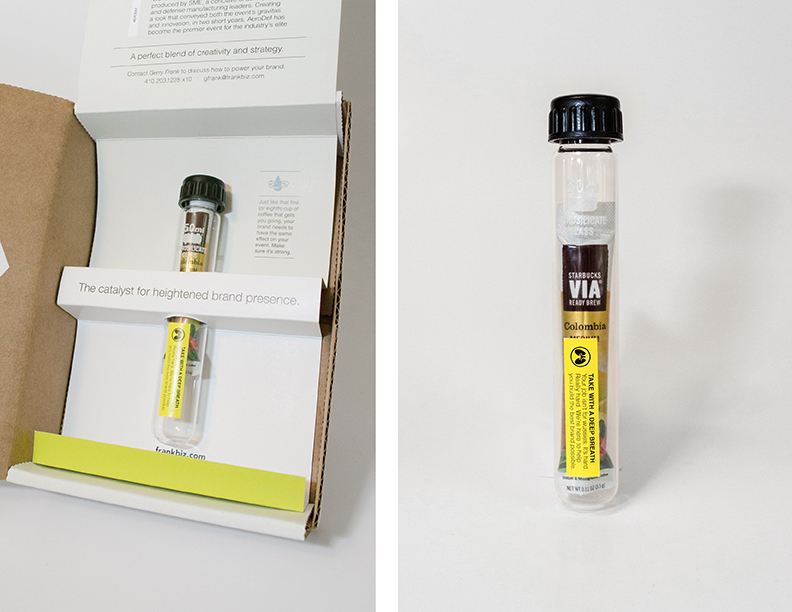 A single serving packet of coffee (it’s caffeine that gets us going early in the morning and late into the evenings) housed in a test tube served as the perfect metaphor for the chemistry behind high-energy brand awareness. 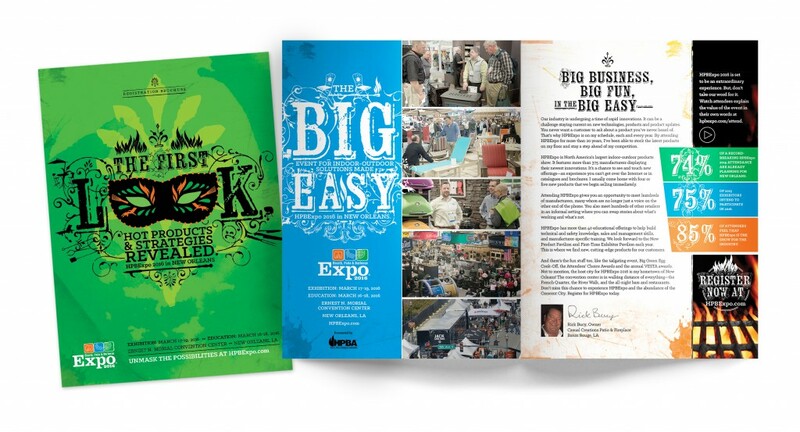 Eventology continues with Exhibotany (the cultivation of the right exhibitors for your event to flourish). 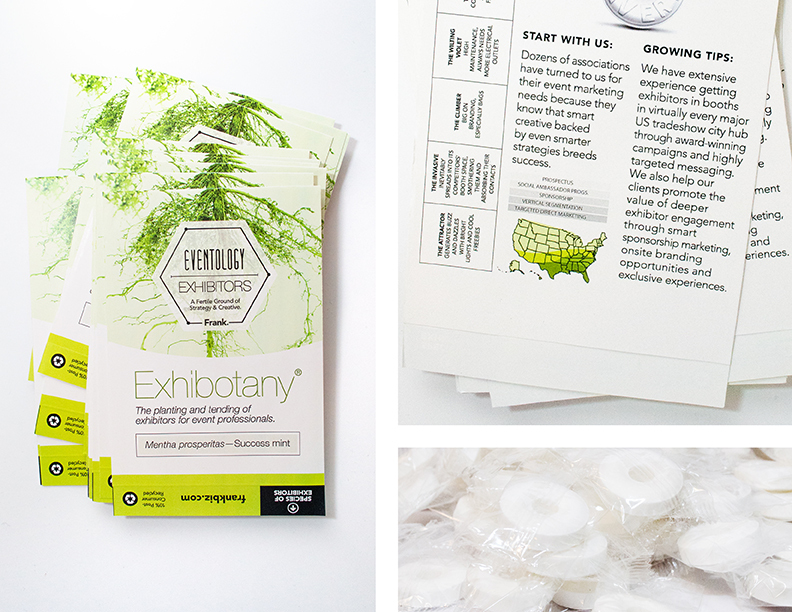 A seed packet (filled with breath mints) drew the parallel between the principles of Botany and getting exhibitors rooted on the show floor thriving with face-to-face interaction. Eventology also incorporates Attendology (the science of attracting an array of attendees and making your event numbers take flight). 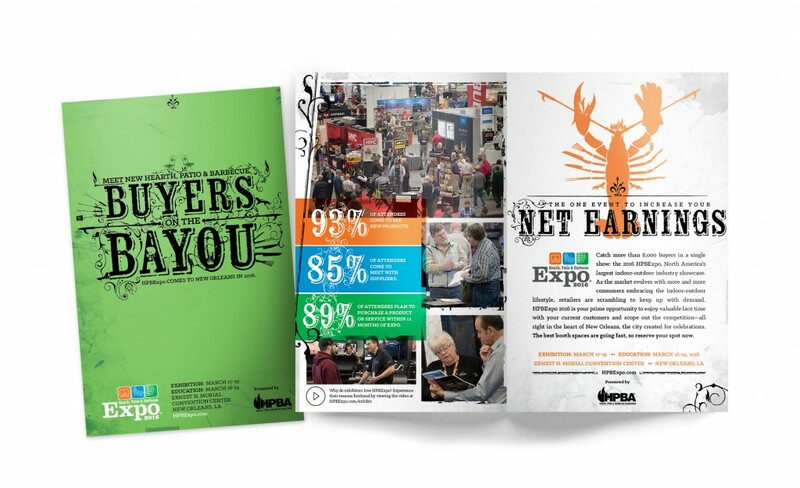 Just like ornithology (the study of birds), attracting a variety of attendees to your event requires an understanding of their complex needs and patterns. 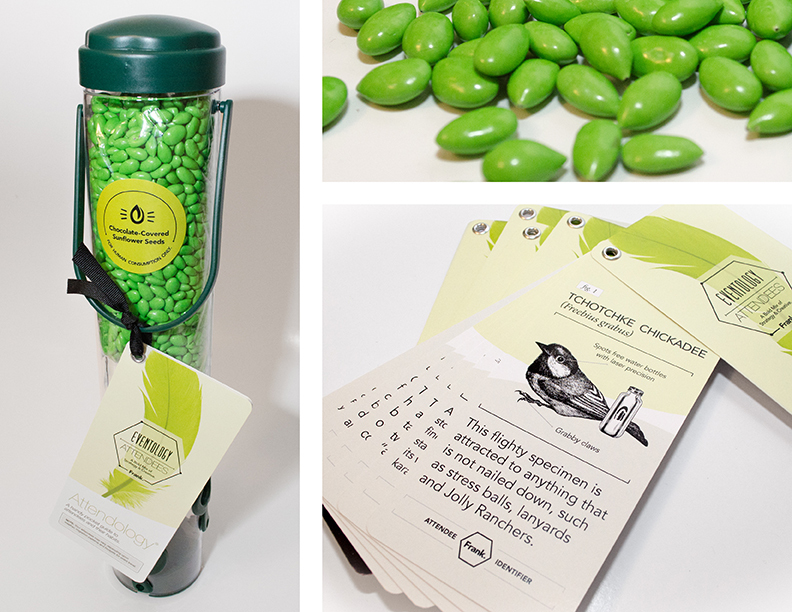 A candy-filled bird feeder accompanied by an “attendee-identifier manual” showcased our understanding of the many challenges event marketers face when attracting attendees to their show. With systematic success and proven methods, Eventology continues to showcase Frank’s ability to enhance events across all industries. To learn more about Eventology and how Frank can improve your event, please contact us. Frank had a great time this year at the American Advertising Federation of Baltimore’s 2015 Addy Awards. 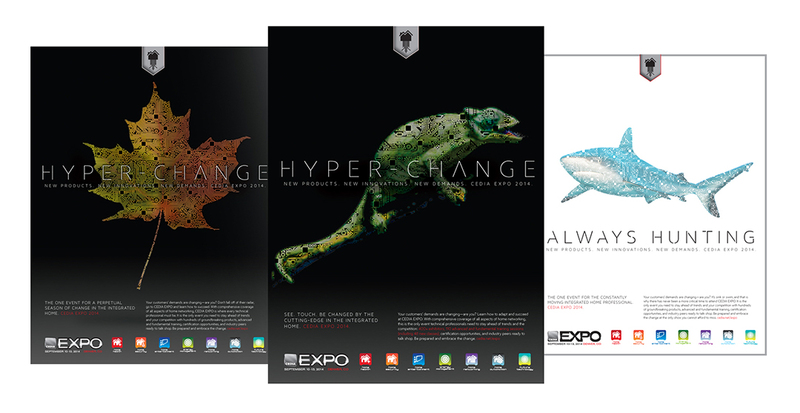 We left the event with TWO Gold awards and Three Silver awards – strong showings in the Campaign and Self-Promotion categories. 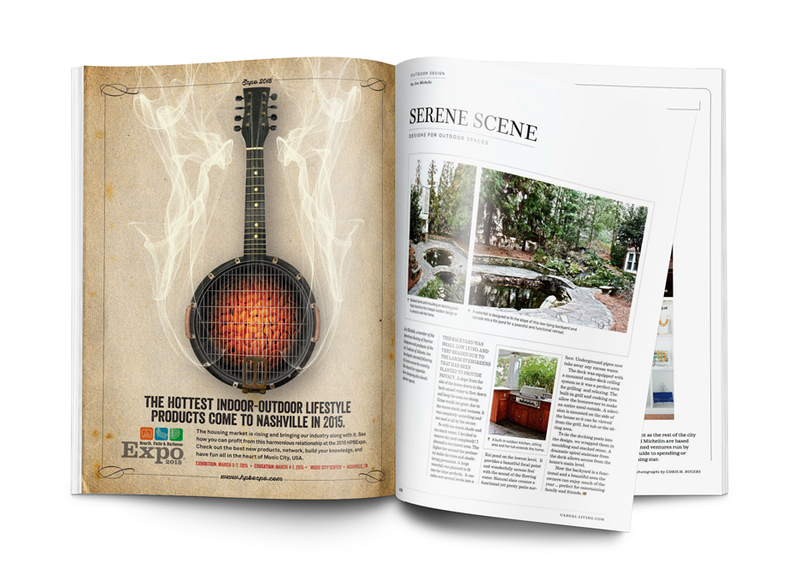 The two starred projects mark our 6th and 7th Addy wins in the Self-Promotion category – something we’re very proud of. It’s easy to put our own campaigns on the back burner – after all, the cobbler’s children often go shoeless. But when we do get a chance to immerse ourselves in these projects, they tend to showcase our creativity very well by pushing the boundaries on concept, design, and production. Now, we at Frank. know that the holidays are traditionally used as a time to air your grievances, marvel at the high electric bill, and open a copious amount of presents. However, most of that will last you an afternoon (maybe an evening, tops). You’ll undoubtedly use the remaining time to cement a new tradition in this new era of media consumption… catching up on your favorite shows or discovering new ones. 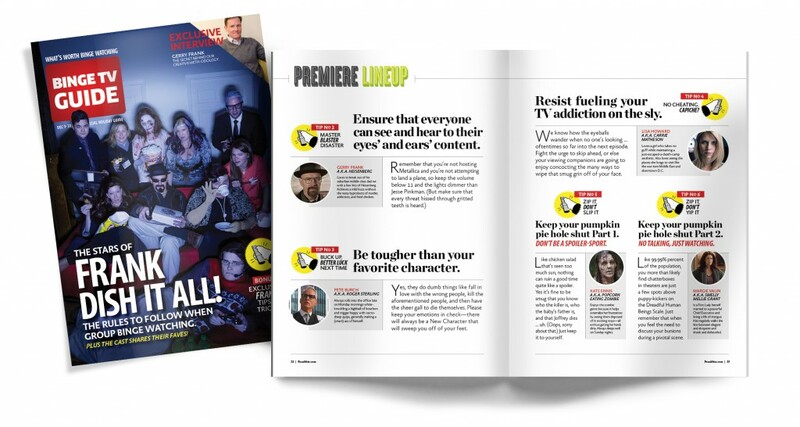 It’s within this spirit that we created the TV Binge-Watching Guide. Based on our collective binge experience, we offer you these tried-and-true rules to employ around the real hearthstone of your living room, the television. Ensure that everyone can see and hear to their eyes’ and ears’ content. Be tougher than your favorite character. Resist fueling your TV addiction on the sly. Keep your pumpkin pie hole shut. Focus on the small screen, not the very small screen. Tame that itchy trigger finger. Reign in your urges until the episode is over. From all of us here at Frank. Strategic Marketing, we wish you a safe, restful and entertaining holiday season! 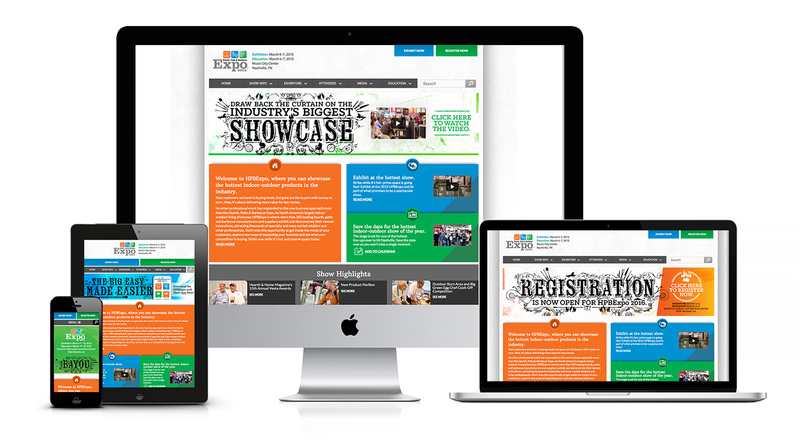 With 60 percent of all digital traffic coming from mobile and tablet devices,1 a good way to make sure your audience maintains a positive impression of your brand is to develop a responsive website – a specially designed and developed site that appears differently based on the type of device it is viewed on (from desktop computer monitors to mobile phones). A responsive design allows users on any device to have an optimal viewing experience – including easy reading and navigation with a minimum of resizing, panning, and scrolling. When compared to siloed mobile-only and desktop-only sites, responsive sites allow for a cohesive brand experience across all devices. These websites should be easily found, shared, quick-to-load, and have an infrastructure that is easy to maintain and build upon. 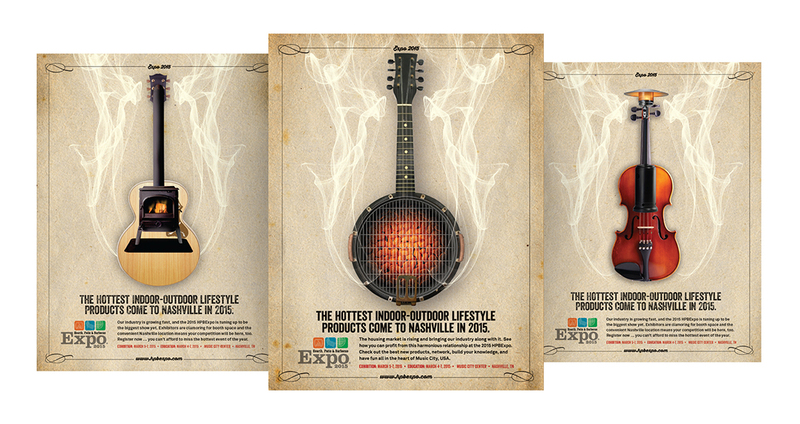 We’ve recently completed a responsive website for the Hearth, Patio & Barbecue Association for their annual tradeshow, HPBExpo. 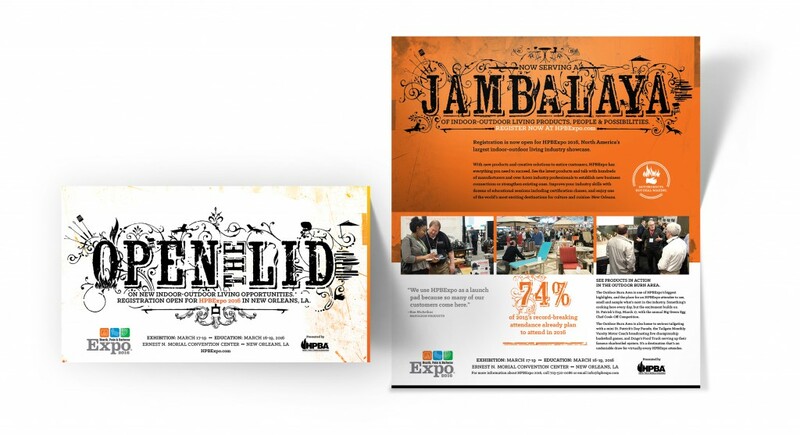 The site was developed with a clear separation of content – between Attendee and Exhibitor – and large colorful blocks for other show highlights. 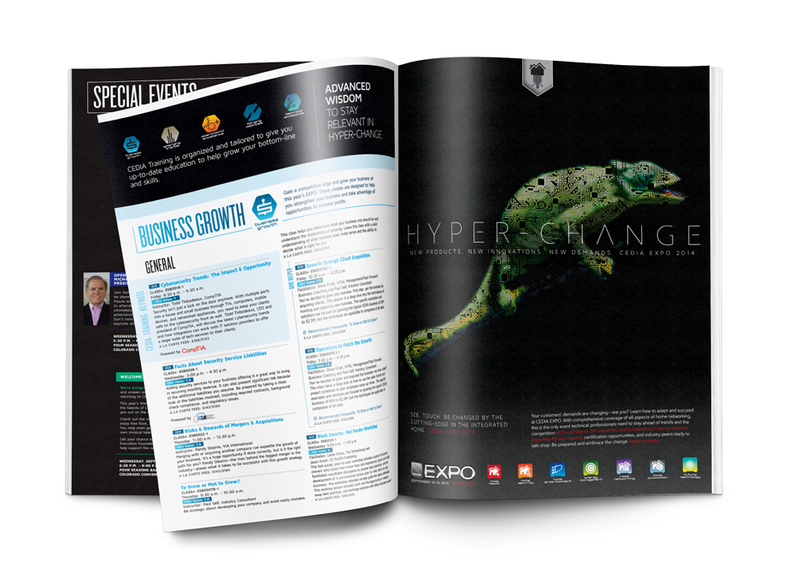 The site also scales – a feature paramount to responsive design – so visitors, regardless of device, will recognize it as the official digital home of HPBExpo. 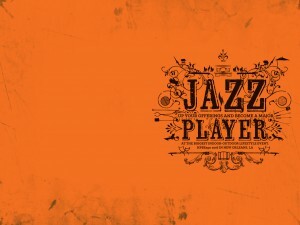 Another key strategy within development was accessing the site’s different user personas. Designing, while keeping the user experience in mind, allowed us to further clarify the sections of content and which areas of the site should be quickly accessible. Since we’ve recently put the finishing touches on the site’s content, we wanted to share the steps we took to ensure the project’s success. Any web-related project can become a tremendous hurdle without proper planning; especially when considering the development of a new (custom built) responsive website. Taking into account web-safe fonts, infinite screen sizes for iPhones vs. Android phones, compatibility issues between Safari, IE, and Chrome etc., there are many areas that we addressed prior to design. Planning upfront for how content will reorganize, menus will condense, and sliders will rotate ensured a smoother development cycle. 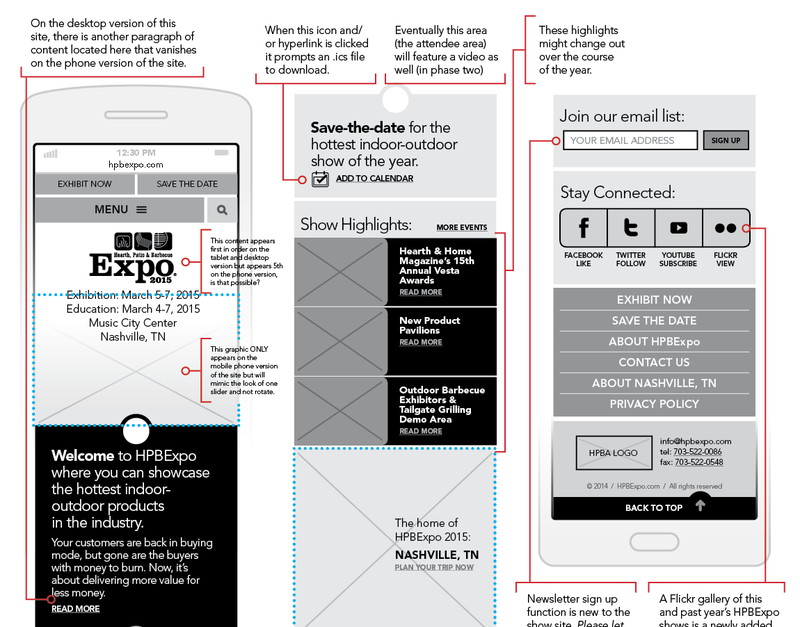 We also developed robust wireframes that outlined content, hierarchy, and other elements for every unique page of the site prior to design. The wireframes allowed the team and client to understand what the page would be displaying, which pages required special coding for graphs, tables, etc, and how certain menu functions would behave across devices. They also allowed us to establish consistent design elements carried across each site version. The biggest component – aside from the design itself – of any website project is the content that will actually be presented. Content – for lack of a better word – is king, and a good portion of our planning dealt with organizing content based on the site’s user needs/personas. For example, accessing the site on a phone, you most likely just need the top level information; so, while all of the site’s content is accessible on the phone version of the site, we hide it behind a non-intrusive/intuitive menu in order to promote a more positive user experience,. Our goal with this site was to develop only the highest caliber design solutions that would easily translate to other versions of the site – typically desktop, tablet, and phone. Menus, subheads, and link static/hover/active states, were important considerations in design development, paying close attention to their behavior in various formats. The desktop and tablet versions utilize similar elements, but the mobile is pared down – removing large blocks of text, rotating-sliders, or expansive images. In the age of scrolling Facebook News Feeds, responsive websites on mobile devices, and the information they feature must be concise. During this project, we found that the “above the fold” theory (all important information for a website should be restricted to the screen length of the visitor) is a myth, extensive use of mobile devices used to access sites have gotten consumers used to scrolling and hunting. We actually started with the mobile version of the site first when designing, and built everything off of that solid foundation and strategy. In this way, we were able to remain consist and clearly define/highlight what would be relevant and beneficial for the user experience. 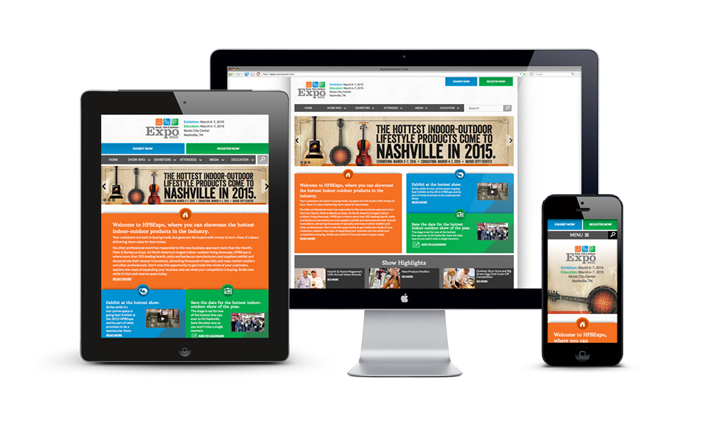 As mentioned previously, there are many variables to consider when developing a responsive website. These differences became immediately known when it came to testing. Our dedicated team blocked and tackled the various browsers, devices, and OS’ that a visitor to the site may be using. 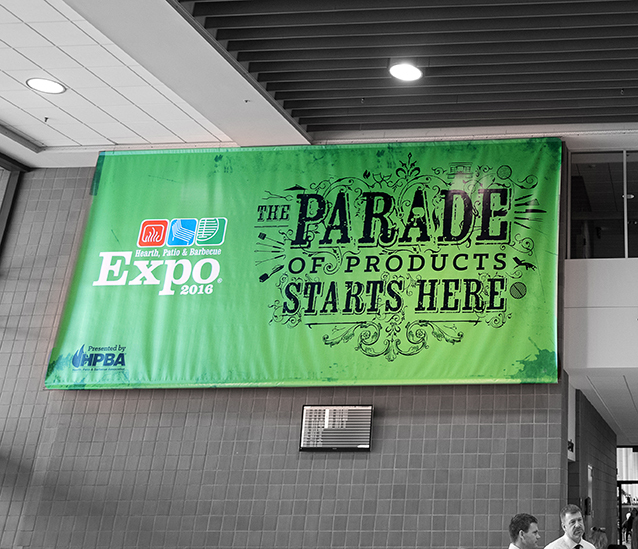 In addition, Google Analytics of the current HPBExpo site helped determine the top browsers and formats being used. Multiple combinations of PC and Internet Browser, Phone and OS, were checked. We utilized a detailed testing document listing every asset a webpage might feature (side nav functionality, font styles (CSS), graphics interacting with text, etc.) and a space for notes, comments, or screenshots. From the combined testing documents, it allowed us to track the bugs, make version exceptions, and make other pixel/padding adjustments to have the site view exactly as we intended. And if you’re interested in a responsive website of your own, well you know who to call.